A new device from Echo Therapeutics promises to speed up the effects of Lidocaine, a topical anesthetic, so shots, IVs, and other medical procedures will be less painful. It’s inching towards FDA approval. What if you could somehow inject drugs without a needle? A company called Echo Therapeutics has been working on this very problem, and took a small step forward yesterday when it received comments from the FDA. It anticipates approval in time to launch its product, called “Prelude,” later this year. One reason why ultimate FDA approval of this device seems likely is that it already approved an earlier version, Soniprep, back in 1994, following its invention by MIT’s Robert Langer. But Echo doesn’t market Soniprep anymore; Mooney likens it to one of those briefcase-sized cell phones from circa 1991, compared with the Prelude. Another reason Mooney is more excited about this version of the device is that he’s settled on a more profitable business model–one where he gives the device away basically at cost, then reaps profits by supplying disposable tips. “The razor blade business model is a much better business model,” he says. “The potential theoretical market opportunity is multiple billions of dollars. There were 1.3 million botox injections last year”–a procedure that could be made less painful with the use of the Prelude and lidocaine. Echo has a corporate partner in the Michigan-based Ferndale Pharma Group, which makes the lidocaine cream. 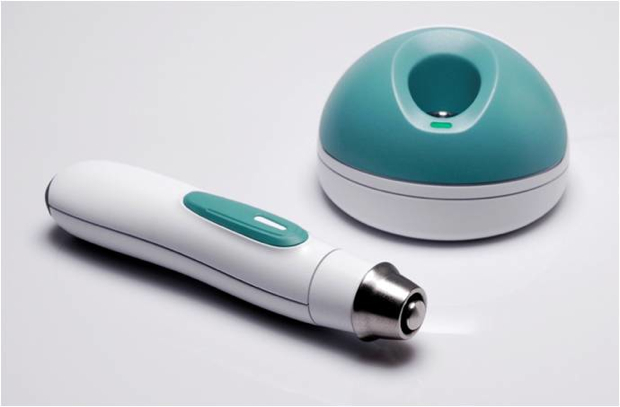 Ferndale will sell the device for Echo, bundled with its own 4% lidocaine cream. Of course, once you open up a portal to the capillaries, you potentially open a two-way street. Not only could the device enable drug delivery, it could also enable the extraction of information. To that end, Echo has also developed something it’s calling “Symphony.” (Notice a pattern? That beautiful dead-skin-shaving process is just like a “prelude” to a symphony, don’t you think?) Once the dead skin is removed, Symphony can track glucose levels in diabetes patients via a remote monitoring system, and can warn of the onset of hypo- or hyperglycemia. That whole getting-things-in-and-out-of-the-body thing has traditionally been one of the more unpleasant parts of medicine; with a painless new portal, Echo does seem to be onto a good idea here. When Fast Company recently spoke to Mooney, he was “cautiously optimistic” about FDA approval; the recent milestone reached only reinforces that optimism, and he thinks that Echo should finally be bringing in revenue soon.